Find hotel near Fabrica De Cerveja Baden .. The Baden Baden beer brand claims to be the most authentically Brazilian of all the craft beers produced within the country. To back up this claim, they’ve designed this immersive guided tour of their brewery. You’re acquainted with the history of the brand, the brewery and the manufacturing process, and beer matching tips. At the end of the tour, there is an obligatory beer tasting session (the reports say the beer is, in fact, excellent). You can also visit the brewery shop for mugs, T-shirts and other memorabilia. Book your tour in advance. Arrive 15 minutes prior to your scheduled visit. Free for kids under 18, but no beer tasting for them. Tours leave every hour until 4pm. How popular is Fabrica De Cerveja Baden Baden? People normally club together Mosteiro De Sao Joao and Ducha De Prata while planning their visit to Fabrica De Cerveja Baden Baden. The experience is very good, we get the opportunity to know more about the history of Baden Baden brewery. The price is excellent for what's offered (R$30 each visitor and you get 3 different kinds of beer to taste and a beautiful Baden Baden glass as a souvenir). I missed some more detailed information about the beers itself and the tour could be a bit longer and that's the only negative point of the visit, we get out wanting more. At the end there's the opportunity to buy the beers, cups (both with excellent prices), t-shirts and others souvenirs (not so cheap). Overall, I totally recommend to schedule this experience in advance, it is worth it! I'ts nice place, the bear is coll and the food is hot!! Great! A visita é bem rápida. Pensamos que seria um tour pela fábrica mas passamos por apenas duas salas, com uma guia que explica um pouco da história da cervejaria e serve 3 taças para degustação. No final, recebemos uma taca de brinde. Pagamos 30 reais. Não tem opcao de meia entrada. 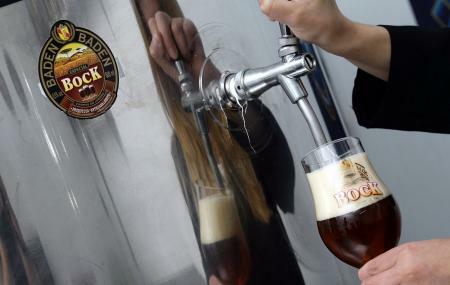 A visita a fábrica da Baden Baden é quase que uma obrigação para quem vai a Campos do Jordão e gosta de tomar uma cerveja gourmet. Age de sua visita pelo 0800 é aproveite. São 3 degustações e no final ganhamos uma taça da Baden Baden vale muito a pena. Chegue uns 20 minutos antes para fazer check-in e aproveite.